Fresno still ‘ground zero’ for terrible air. Why did Valley Air District blow off major hearing? They came to Fresno from all over California and the West to make their voices heard in the struggle for clean air. Air quality officials, politicians, doctors, activists, ordinary citizens — they all turned out for a U.S. Environmental Protection Agency public hearing to speak out against the Trump Administration’s proposed weakening of vehicle emissions regulations. Representatives of the auto industry gave the opposing view. Yes, that’s the air we breathe every day. But guess what? 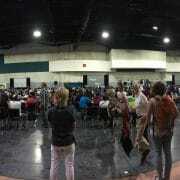 I couldn’t find Executive Director Samir Sheikh, or anyone else. A public hearing over a rollback of vehicle emissions standards was held in Fresno, and no one from the Valley Air District deemed it important enough to attend. Don’t you find that a bit odd? I do. Wayne Nastri’s name was on the list of speakers. Nastri is executive director of the South Coast Air Quality Management District, where the air is sometimes even dirtier than ours. His office is in Diamond Bar, 245 miles away, but still took the time and made the effort to get to Fresno. So I called to find out why. Jack Broadbent, air pollution control officer for the Bay Area Air Quality Management District, came from San Francisco to speak. Why did he feel it was important? “It was very important that our voice be heard,” Roselius added. Of course I contacted the Valley Air District, whose office is in central Fresno, to find out why no one from the bureaucracy entrusted with improving our health didn’t raise its voice, on our behalf. Sorry, but that’s not good enough. The executive director of the Valley Air District earns more than $300,000 in annual salary. With benefits, his pay exceeds $400,000. A good chunk is taxpayer money. Surely, Sheikh could have found the time for such an important hearing, one held in his backyard. If not, he could have designated someone else. The air district website lists more than 100 employees. One explanation for the absence could be that Valley Air District officials, as guided by the governing board, are quietly pleased at President Trump’s efforts to weaken our environmental laws, even if that means dirtier air for you and I. Why? Because the end result would take the heat off them. Such is the contention of local environmental activist Kevin Hall. I’m not going to double down on Hall’s comments, but it does make you think. But that’s a subject for another day. 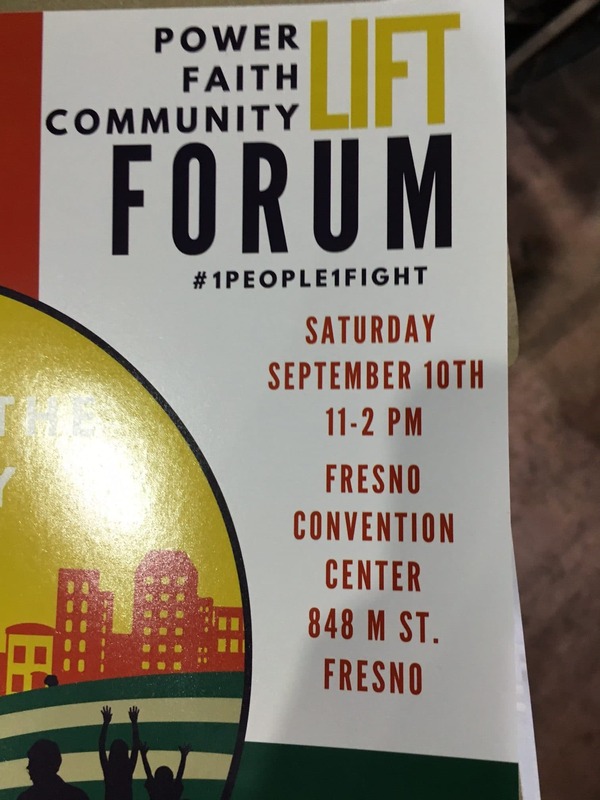 For now, let’s leave it here: Fresno hosted a major EPA hearing on vehicle emissions, one of three held across the nation, and our local air officials no-showed. Which is definitely a bit odd. Fresno still ‘ground zero’ for terrible air. Why did Valley Air District blow off major hearing?, by Marek Warszawski, The Fresno Bee, October 8, 2018.
https://cleanpowerexchange.org/wp-content/uploads/2016/08/Californias_Central_Valley.jpg 1169 2048 News Article Repost https://cleanpowerexchange.org/wp-content/uploads/2016/03/cpx-logo-1.png News Article Repost2018-10-08 13:31:232018-10-10 13:38:46Fresno still ‘ground zero’ for terrible air. Why did Valley Air District blow off major hearing? A Hot Issue: Fresno’s Getting Warmer …But We Could Change That. July marks the first full month of summer. Here in Fresno, the seventh month of the year is the peak of the area’s grueling high temperatures during the season. This summer presented Fresno’s unyielding heat waves slightly earlier than normal, and will continue on until early fall. 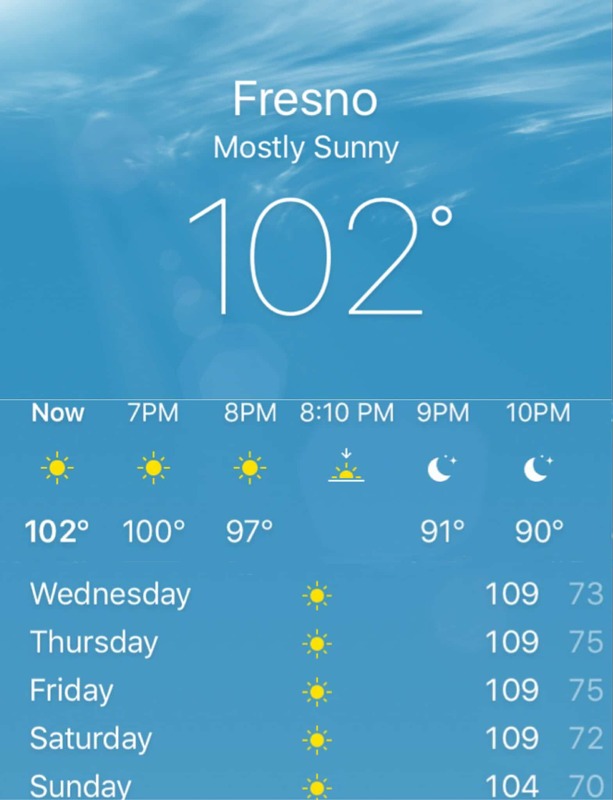 Just a few days after the summer started, Fresno experienced a record-breaking heatwave. 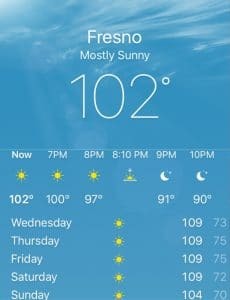 Whereas normal days in the beginning of the season hover around the mid-nineties, parts of Fresno County hit highs closer to 110 degrees, forcing some communities to open cooling centers during the day. It should come as no surprise that the National Weather Service encourages people to stay indoors during hours of blistering temperature highs. When the summer heat becomes unbearable, people rely on their homes to keep cool. Utility customer’s consumption of electricity goes up during summer months, particularly in areas with significant heat. Such a high demand during these periods not only raises electricity rates but also increases fossil fuel consumption used to produce the electricity, and the use of fossil fuels has a direct link to rising global temperatures. Climate Change continues to impact the San Joaquin Valley with temperatures steadily rising over the past decades. Studies show an average of 1°C increase during the first half of the century and then a 2°C increase by the second half, combined with a significant decrease in precipitation. One particular concern is the increase of the temperature of daily low temperatures. The Central Valley is noted for experiencing a wide range of high and low temperatures throughout a 24-hour period. 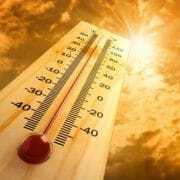 But according to studies, this phenomenon is declining as Valley morning and nightly low temperatures are beginning to rise, marking longer stretches of intense heat during summer months. Such elongated temperature highs during the day contribute to rising use of energy consumption throughout a 24-hour period in the season of sunshine. An additional concern about higher than normal overnight temperatures is that many fruit and nut trees grown in the Central Valley require a certain number of “chill hours” in order to produce a crop. Although California’s investor owned utilities (IOUs) have made promises to expand usage of clean energy, fossil fuels are still a large source in generating power for homes and businesses. According to the U.S. Energy Information Administration, the country generated four trillion kilowatt hours of electricity in 2015. Close to 67% of that electricity came from fossil fuel sources (coal, natural gas and petroleum) while only 13% came from cleaner, renewable sources such as hydropower, solar and wind. According to the IOUs maintaining the grid and expanding the use of renewable energy comes at an ever-increasing price. This month, the California Public Utilities Commission held public hearings in several Central Valley cities to discuss the area’s utility provider rate increase, with the company arguing it is needed for further investment in grid maintenance and clean energy sources. 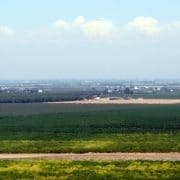 So, Fresno and its surrounding areas get very hot during the summer, heat waves seem to be getting more intense due to climate change, and the direct culprit behind climate change, fossil energy, is still a major source for powering our electricity to cool us down: sounds like one vicious cycle, right? Well, first, let’s take a look at that IOU claim that renewable energy costs more. The fact is that solar and wind power prices have dropped dramatically over the past six years. So much so that solar and wind are now at or near “grid parity” in many markets meaning that they are equivalent or lower in cost than conventional power sources. But who will take advantage of this fact and pursue this cleaner, cheaper power on our community’s behalf? One answer is Community Choice Energy. Community Choice Energy is a program, enabled by state law passed in 2002, that has the power to buy, and may even generate, electricity for its residents and businesses via a not-for-profit public entity; created by the people, for the people. The program offers several economic and environmental benefits such as providing consumer choice, competition in the monopolized utility market, offering lower rates, strengthening the local economy, and utilizing alternative energy sources. The four existing Community Choice agencies in California have proven the concept. Perhaps, more than ever, now is the time to explore a program that emphasizes cleaner, renewable energy sources for its residents at competitive rates. After all, it certainly isn’t getting any cooler over here. July temperatures in Fresno this year have hit the triple digits on multiple occasions. https://cleanpowerexchange.org/wp-content/uploads/2016/07/FullSizeRender1.jpg 734 750 Erik Cherkaski https://cleanpowerexchange.org/wp-content/uploads/2016/03/cpx-logo-1.png Erik Cherkaski2016-07-26 19:15:542016-07-28 15:46:34A Hot Issue: Fresno’s Getting Warmer …But We Could Change That. The amount of solar energy generated on Fresno-area warehouses and distribution centers – 11,132 kilowatts – is larger than the amount from equipment installed in the Silicon Valley and the greater Los Angeles areas combined, the 2016 California Green Innovation Indexsaid. Fresno’s solar capacity doesn’t stop there. The area also ranks fifth out of 26 metro areas for commercial solar, on retail centers and offices, and sixth for solar on homes. 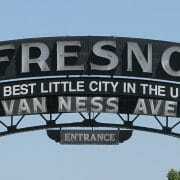 THE FRESNO REGION IS NO. 1 IN CALIFORNIA FOR THE AMOUNT OF INDUSTRIAL SOLAR POWER INSTALLED, NO. 5 FOR COMMERCIAL SOLAR AND NO. 6 FOR RESIDENTIAL SOLAR. “That’s very impressive and shows the adoption of solar out in the Fresno area, which is very important to the future of the state,” said Noel Perry, founder ofNext 10, the organization that commissioned the index. Adam Fowler of Beacon Economics in Los Angeles wrote the study. The report, released Wednesday, tracks economic and environmental trends at the regional, state, national and international levels. It found that the San Joaquin Valley and the Inland Empire are driving California’s solar power growth, which saw a 1,378 percent increase between 2009 and 2014. Silicon Valley and San Francisco are known for clean-tech innovations and patents “so it’s important to really see other parts of the state really taking part in solar,” Perry said. OUT IN FRESNO AND SAN BERNARDINO COUNTY, THERE’S A LOT OF SUN … THERE’S NEW HOUSING STOCK. THERE’S A LOT OF ROOFS TO PUT SOLAR ON. Riverside, San Bernardino and Ontario ranked No. 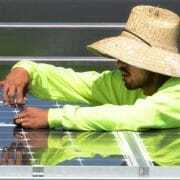 1 for commercial and residential solar power, the index said. Hanford and Corcoran made the list for leading the state in commercial and industrial solar capacity.